Courtney Lawes and Tom Wood will square up to Saints team-mate George North at Twickenham on Saturday night (kick-off 8pm). Lawes and Wood both keep their place in the England side for World Cup Pool A game against Wales, who have selected North at 14. 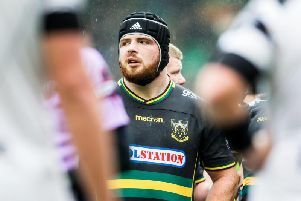 New Saints prop Kieran Brookes will again be on the bench for England. Both teams have changed since their opening game, with England opting to bring in Billy Vunipola, Owen Farrell and Sam Burgess for Ben Morgan, George Ford and Jonathan Joseph. Stuart Lancaster’s men thrashed Fiji 35-11 last Friday, securing a bonus point in the process. Wales also got off to a winning start, cruising to a 54-9 success against Uruguay on Sunday. North did not play in that game, but he returns in a much-changed side which also includes the likes of Alun-Wyn Jones and Sam Warburton. Elsewhere this weekend, three Saints players will be in Samoa’s 23 for Saturday’s clash with South Africa at Villa Park (kick-off 4.45pm). Kahn Fotuali’i and Ken Pisi start, while George Pisi returns to the squad after missing last Sunday’s win against the USA in Brighton, taking his place on the bench. New Saints lock Victor Matfield is again in the South Africa side as they bid to bounce back from last Saturday’s shock defeat to Japan.